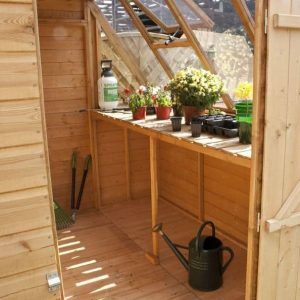 If you’re a keen gardener, this combined potting shed and greenhouse is highly recommended. 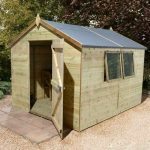 Providing space to grow your plants and produce, as well as a separate space to store your gardening essentials, this good sized building has an attractive yet practical design. One of its standout features is the fact it has been UV treated. So not only is it resistant to the wind and rain, but it is also protected against the sun’s harsh rays. Shiplap tongue and groove cladding is used to create a very strong and durable building. It also benefits from extra thick framing, ensuring you are left with a structurally stable unit. A well braced single door can be placed on any panel, except for the one with the styrene glazed windows. Modular design sheds offer maximum flexibility and allow you to customise the shed’s design to best suit your needs. The windows on the greenhouse part of the shed are glazed with styrene. Safer than glass, this plastic alternative is 100% shatterproof. Most of the windows are fixed, but there’s a small window which you can open to allow in adequate ventilation. This is a stunning building with plenty of fantastic features. Its unique and stylish design makes it a must have for any garden. Isn’t painted. Personally we like the unpainted natural design, but for those who don’t, coloured treatments provide an affordable way to alter the colour of the building. 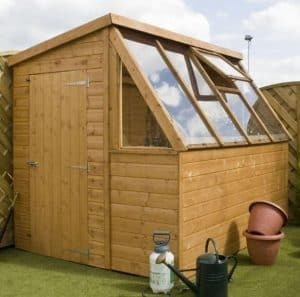 This is a uniquely designed 2-in-1 greenhouse and potting shed. Its great space saving design makes it a fantastic choice for smaller gardens. 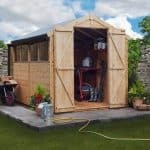 It has a split design, meaning the amount of storage space provided isn’t as much as you’d get with a dedicated 8×6 storage shed. However, it does come with an integrated shelf on the greenhouse side, with plenty of space underneath it. This is a really tall building, with a slightly higher front than back. This is down to the pent roof which slopes downwards towards the rear of the shed. However, that isn’t the only sloping feature on this building. The greenhouse part at the front of the shed features sloping glass. It extends out from under the roof, allowing it to benefit from plenty of natural sunlight. The sloping design acts as a further water resistant feature too. So whilst the measurements above appear to be pretty standard, the actual shape of the shed is completely unique. One tell-tale sign of a good quality building is the strength of its interior. Many manufacturers use high quality, thick cladding for the exterior walls, then cut costs on the inside of the building with solid sheet materials. That isn’t the case with this shed. Both the floor and the roof are created with the same 12mm tongue and groove timber as the rest of the building. So you’re guaranteed an exceptional quality, stable structure. The roof has a pent design which means it is flatter than the more common apex sheds. It also slopes downwards to ensure rainwater drains down the roof onto the floor. This design means it provides a neater finish if assembled in front of a fence or another building. It also means you can easily install it underneath a low hanging tree. Waltons also supply free heavy duty mineral felt which will protect the roof further from rainwater damage. As the floor is also made with tongue and groove materials, it is suitable for any type of storage. Solid sheet material floors on the other hand, tend to only be suitable for light or at best, medium weight, storage. What’s interesting is that the manufacturer also provides a free floor support kit. We don’t really feel this is needed, but as it comes for free it makes sense to take advantage of it. The 28mm support pack will add a little more strength, creating a more solid foundation. This is important when you’re storing heavy gardening equipment such as heavy bags of compost and lawnmowers. The entire shed is built with 12mm tongue and groove cladding. The main structure of the building features Shiplap tongue and groove; the highest quality cladding type available. This gives it a very high quality, long lasting, secure design. The reason it is so highly regarded is because it isn’t just really thick, but it also has an indented channel running throughout each panel. This successfully drains the water away from the shed, providing an extra level of waterproof protection. Tongue and groove also has numerous benefits compared to overlap. Firstly there’s the way it is actually designed. Just like you find with solid wood and laminate flooring, each panel comes with a groove at one end and a tongue at the other. This allows the panels to just click easily into place, making the assembly of the shed a lot easier than overlap. It also creates more of an interlocking design once the panels have clicked into place. This further acts as a barrier against rainwater and high winds. Another beneficial aspect of tongue and groove is that it has an expansion gap. This is there to ensure that if the timber swells or changes throughout the year, it will not affect the structural safety of the building. Generally speaking, Shiplap isn’t prone to warping, but that doesn’t mean it won’t if the shed is faced with extreme changes in either heat or moisture. So externally you know the shed is exceptionally sturdy, but what about the inside? To provide ample support for the cladding, Walton’s have used a 45mm x 27mm wooden frame. This is thicker than what you find in most sheds and it ensures the building is 100% supported. The shed comes with a 10 year anti-rot guarantee, though it does need to be maintained in order to meet the terms and conditions of the warranty. One of the main benefits of Shiplap cladding is the fact you can get away with treating it less frequently than an overlap clad shed. However this largely depends upon which type of treatment you use. The building needs to be treated as soon as it has been erected. It has been factory dip treated, but this is only to protect it during shipping. 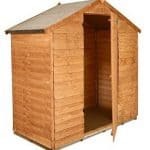 You’ll notice Waltons provide a free water based 5L Golden Brown treatment when you purchase the shed. If you decide to use this alone, you will need to reapply the treatment once yearly. Alternatively, you can apply this free colour treatment over the top of a spirit based treatment. It won’t provide the same results as applying the colour directly onto the timber, but it will ensure the building has extreme weather protection and you’ll still benefit from a tinted colour finish. There is a single door and on the picture it is located on the left hand side of the building. However, what’s clever about this unit is that it comes with a modular design. This simply means you can move the door onto any other panel, apart from the greenhouse glazed section. It also comes fitted with a pad bolt and has a well braced design, preventing it from sagging. The windows are also a unique feature of the shed. As they provide a greenhouse effect, they are tall, large and have an unusual sloping design. They protrude outwards away from the overhang of the roof so that direct sunlight can penetrate through the glass, aiding with the growth of plants, flowers and produce. One small window can be opened and to allow ventilation into the building. As they are made from styrene, they are shatterproof and stronger than single glazed windows. Whilst there is a pad bolt on the door, this will only keep it shut; it won’t actually lock the door. So you will need to buy a padlock if you’re concerned about security. The large windows also eliminate any privacy in the building. It is worth noting however, that thieves are less likely to target a potting shed and greenhouse; especially if they just see flowers growing through the window. It’s mainly designed to hold your plants and any gardening equipment you might need. So naturally it is less tempting to break into. Saying that, it doesn’t hurt to improve the security where you can. You are greeted with very few customisation and extra options. The charcoal superior duty felt is one of the more useful customisation options. Pure fibreglass, this felt is significantly stronger and more effective than the supplied heavy duty felt. It has more of a textured design, though this is something that would be more beneficial on an apex style roof where you can actually see the felt. With pent roofs unless you’re really tall, you’re not going to see much of the felt on top. It is worth buying though as it won’t perish like the mineral felt provided. Purely to get the maximum longevity benefits from the shed, you may want to consider the extra strength floor support. This really isn’t essential though as the tongue and groove floor is more than strong enough to support anything you need to cultivate your plants. 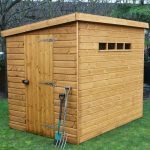 Two extras which you should definitely consider are the 8×6 Waltons Pro Shed Base and the 49mm padlock. The Pro Base is made with 100% recycled plastic. This makes it environmentally friendly. As it comes in a grid design, the base of the building benefits from great ventilation, ensuring damp never becomes a problem. 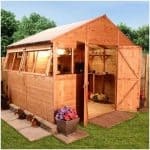 It also makes sure the shed and greenhouse are 100% stable, providing a firm and flat solid base. 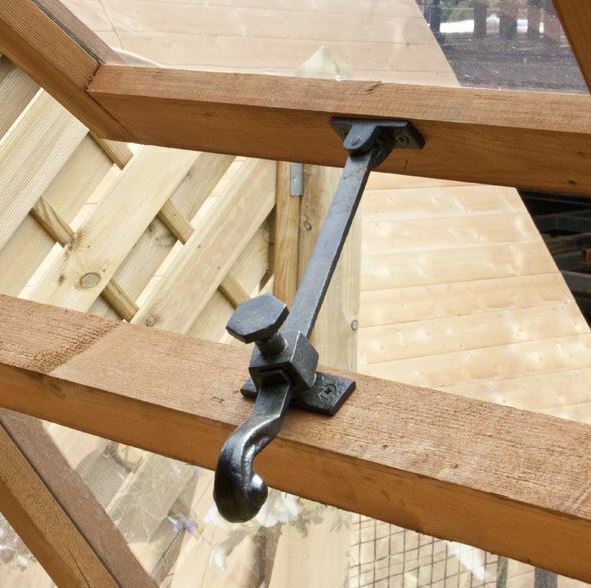 The padlock obviously helps to improve the security of the shed and will easily install onto the fitted pad bolt. This little lock is affordable, yet extremely hard wearing. It comes armed with features such as a Thermoplastic weatherproof jacket and a steel laminated body. It is also sold with a free hasp and staple. The stylish design of this shed is impressive. The fact it is also fully constructed with 12mm tongue and groove cladding throughout is a massive advantage. It boasts an exceptional quality design, both inside and out. If you look after the shed with regular treatments, it is guaranteed to last at least a decade. Shiplap has a naturally hard wearing design, with great water resistance. As the shed is split into both a greenhouse and storage area, it doesn’t provide as much space as a general storage shed. However, it does come with a brilliant internal shelf next to the glazed panels where you can grow whatever you like. Underneath that shelf there is also a good amount of space to store compost or anything else gardening related. Some customers have had slight issues with the installation of this building, but they are very minor. For example, you may find it difficult getting certain parts of the shed lined up correctly, such as the roof. It is also recommended you use power tools, rather than hand tools. Overall though the instructions are detailed and simple to follow and it shouldn’t take too long to put together. With 2 people you’re looking at 3-4 hours. We feel this little building gives you great value for money. Its stylish design and range of weather resistant features are fantastic. 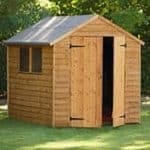 You also don’t really need to upgrade anything so this saves you money compared to some other, cheaper and lower quality sheds. Final Thoughts: With its strong build and exceptional range of features, this combined potting shed and greenhouse is perfect for avid gardeners. Whilst it contains a lot of windows on the greenhouse part of the building, the storage area remains completely private. Its 2-in-1 design makes it ideal for those who don’t have a lot of space available. If you don’t require a large storage space and you’d like to grow your own produce, plants and flowers, this is the perfect building for you. Due to its significantly tough build, it requires very few extras or upgrades. This saves you money and makes the wooden greenhouse and potting shed much more affordable.